Shark Panic Arcade Machine is an innovative hammer/whacker game with a small footprint which makes it ideal to link to other cabinets for interactive play. This machine has colorful cabinet, with lighting behind the acrylic that makes it really stand out from the crowd. This game is designed for younger players and is best suited to family-friendly locations, such as Family Entertainment Centers or chidlrens entertainment areas. To play, players siomply get the mallet and whack the shark every time it comes of of it's underwater cave, and they will earn points for every shark they hit. But be careful, the little clown fish pop their heads out to every now and then, and you don't want to hit them! 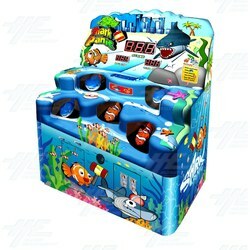 This bright and colourful ocean-themed arcade machine, with it's catchy music and simple gameplay, will draw kids in from all across the floor! This works well in a wide variety of locations due to it's small footprint, and works best in family-friendly locations. Loads of fun for young players of all ages! Shark Panic Arcade Machine is an innovative hammer/whacker game with a small footprint which makes it ideal to link to other cabinets for interactive play. This machine has colorful cabinet, with lighting behind the acrylic that makes it really stand out from the crowd. This game is designed for younger players and is best suited to family-friendly locations, such as Family Entertainment Centers or chidlrens entertainment areas. To play, players siomply get the mallet and whack the shark every time it comes of of it's underwater cave, and they will earn points for every shark they hit. But be careful, the little clown fish pop their heads out to every now and then, and you don't want to hit them! This bright and colourful ocean-themed arcade machine, with it's catchy music and simple gameplay, will draw kids in from all across the floor! This works well in a wide variety of locations due to it's small footprint, and works best in family-friendly locations. Loads of fun for young players of all ages!